The Book Thief explains some of the events that occurred in Nazi Germany during WWII. It's really neat to get a different perspective of the war, instead of it being from the Jews' side like a lot of other books tell about. I do not really care if this gives details away; I am reading, and cannot stand not knowing what has happened to Max after Hans sent him away for safety. Can anyone tell me if he comes back? Well Candace, Max gets captured by the Nazis, and is one day marched down Himmel Street with the other Jews. Liesel runs out there aqnd gets in trouble with the Nazis. That's as much detail that I can go into. Ok thanks. Now that I'm further into it, I thought something like that would happen. Also they meet each other at the end of the war. Right, when everyone dies because of the bomb, Liesel goes to live with Alex Steiner, (he was at the war,) and Max shows up one day. Good job, I like how it seems to be written when Leisel is older and looking back! I can not wait for the rest to be written. Keep it up! Another collage using pictures from the little books Max made from Mein Kampf. Make sure to read the words as they are the ones that tell the story here. That's an awesome collage! I was always confused though about what Mein Kampf was and what the content of it was……does anyone know?? In English 'Mein Kampf' is My Struggle. It's an autobiography, that includes Hitler's political views and stuff like that. There was two volumes of it; one came out in 1925, the other in 1926. He originally wanted to call the book Viereinhalb Jahre (des Kampfes) gegen Lüge, Dummheit und Feigheit (Four and a Half Years (of Struggle) Against Lies, Stupidity and Cowardice). Okay. We got it to work! But this was my comment, please recognize it as such! I love the way you copy/pasted the story together. It's very, very lovely, and we all heart you, ginger chan. (Yes, we can heart you without hearts.) Anyways, it is, quite honestly, a gorgegeously layed out representation of what happened in the book. How did Liesel's brother die? How are you sapose to pronounce the words like saumensch and Liesel and the saukyle or whatever? I'm pretty sure saumensch is pronounced sa-munch, or somewhere along those lines. Saurkerl, i believe, is pronounced like soccer-ole. I was wondering how Rudy died, it says that he died or hypothermia but it also says that when he died "he would've loved to see the frightening rubble and swelling of the sky on the night he passed away", suggesting there was a nearby bomb exploding. It also says that he would've loved to witness Liesel kissing his "bomb-hit lips" when she discovered him. So did Rudy Steiner die of hypothermia or did he die from an explosion? It doesn't say he died of Hypothermia, it just says that one would think he died of hypothermia. That really did confuse me. I thought he did die of hypothermia, but death says… Rudy Steiner does not deserve to die the way he does. That is true it isn't fair someone with his skill and charm dies of a bombing without getting his kiss until he dies. I think he died during the bombing, because Death describes getting Rudy's soul along with Hans', Rosa's, and many others that night. I have another question, does anyone else find the book to be a little confusing as to what order the storyline is in? For example in one paragraph death explains that Rudy Steiner dies, and then the next paragraph is about Rudy and Liesel in present time where they are playing soccer? It's a little confusing to me.. I found it kind of confusing at first, but when you finish it, everything wraps up nicely with no loose ends. It would have been cool if the author did not skip over the last two years of the war, 1944 and 1945, because a lot of interesting things happen such as the Allies taking over Germany. As Interesting as the war was, the last two years were kind of inconsequential to the story. Death introduces himself as a kind person, just doing his job. He explains what the colours in the sky represent, and begins to tell the story of Liesel Meminger. 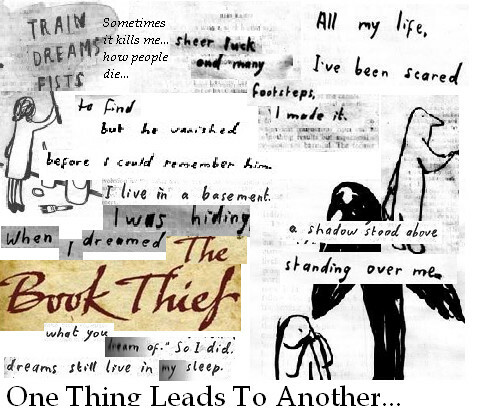 Turns out that they actually are making a movie of the book thief, set to come out 2010. I'm for sure going to see it when it comes out. I would love to go see the movie, but once you read a book, the movie is never as good. You have a set idea of each character and scene, and sometimes certain things are removed in the movie. If you watch the movie in a mind-set that the book was never written, then movies are perfectly fine. I'll be sure to see the movie, though. Death is much more than an important theme in the novel, death is THE MAIN THEME. Death is the narrator, death is probably the reason that this book was written. Zusak wanted to show people that death is an unstoppable, completely natural force, and that there is nothing evil about it. This all relates back to when we had to class discussion about the line death said "I am a result." Zusak says that Death is just exhausted from his eternal existence, that he is afraid of humans and actually attempting to prove to himself that us humans are worth all the trouble he goes through.